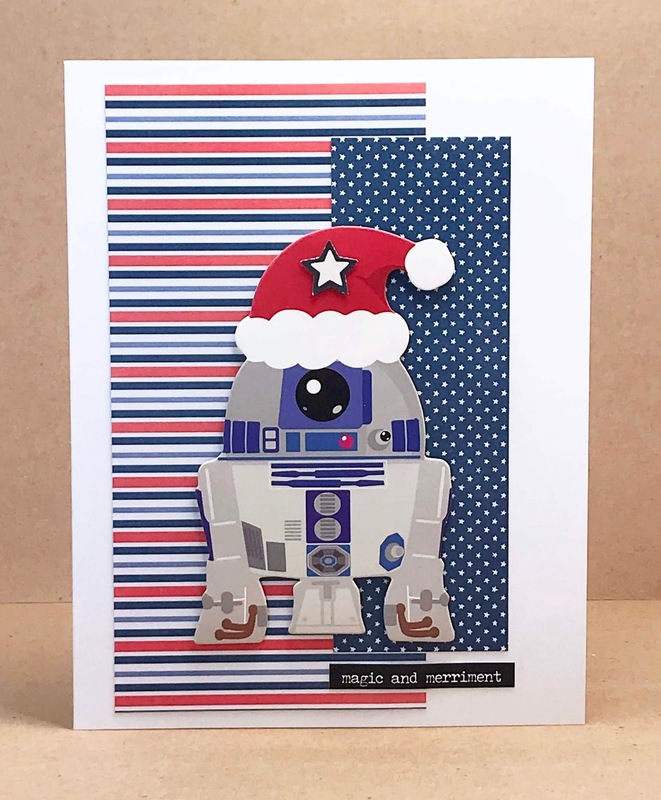 Next week in the USA we will be celebrating Independence Day, so we're asking you to incorporate either stars or stripes into your card design. They need not be red, white or blue … just stars or stripes (or both if you're an overachiever). 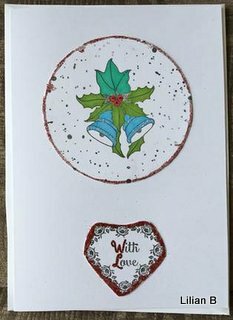 Stephanie says, "I started with Striped paper and coordinating Star paper using this week's sketch from The Paper Players. They both coordinated perfectly with my Christmas R2-D2. I punched a star from a third paper to cover the tag hole in his Christmas Hat. The finishing touch was a sticker sentiment." Lauren says, "I've combined lots of different elements for this one. The striped paper and journal card are both older Echo Park papers. 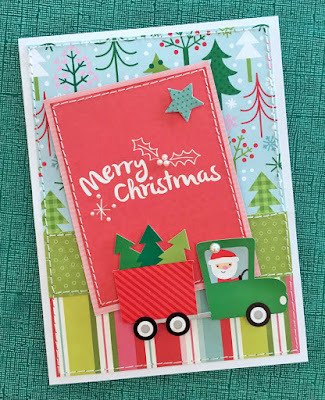 The tree paper and the Santa sticker are slightly newer, from Doodlebug. The green scrap and the cardstock star punch-out are both so old, I'm honestly not even sure who made them, lol. But everything came together when I used the current Sketch Saturday to guide my layout." Link your star-struck and/or stripey masterpieces here by 6pm (EST) on Wednesday, July 11th. Keyword for galleries or Flickr is JB:18:14. 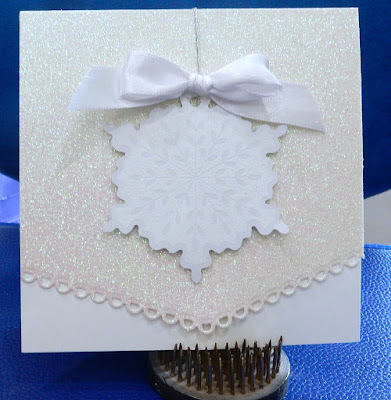 ...traded color for sparkle, dimension and beautiful attention to detail --like that awesome scalloped, lacy edge-- in her perfectly CAS creation. ...made three (3!) gloriously all-white layery creations of which it is impossible to choose a favorite, so you need to visit her blog and see the other two, ASAP! We're still creating cards featuring the color (or lack of color) WHITE. 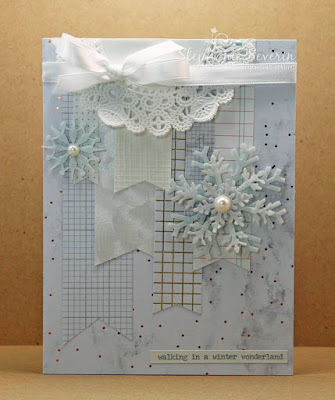 Lauren says, "I've been having fun this week using up scraps of paper to make this fun (easy!) herringbone pattern, so while I was still in that phase, I decided to make a card using all of my white, cream, ecru, magnolia and nearly-grey-but-not-quite scraps! There are some process pics in this blog post, but I'll warn you right now, it's addictive, lol! Meanwhile the combination of snowflakes + flowers never stops looking good to me, so I've added a stack, secured with a fancy Eyelet Outlet pearl brad." Stephanie says, "I went with Lauren's tip from last week and added texture. 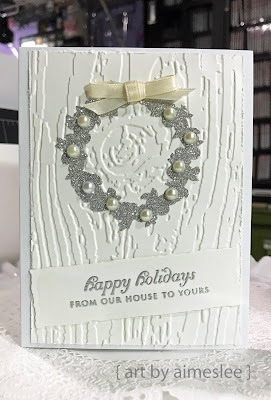 I die cut and embossed my Tim Holtz Layered Holiday Wreath on white textured cardstock. Then I cut it a second time from gold cardstock and off-set them slightly to create a *shadow*. I curled the leaves & bow for a bit more texture and added a sticker sentiment & white pearl." Scroll down to the original White Xmas post to see the gorgeous readers' gallery and link your own masterpiece(s)! 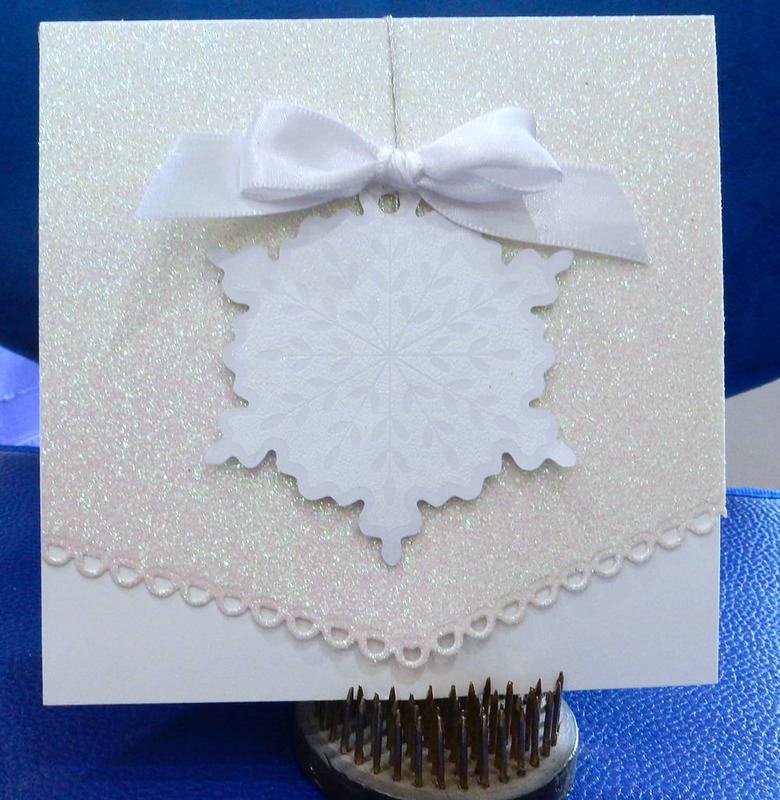 This week we're asking you to go WHITE ... create a card that predominantly features the color white. Maybe you'll create with snowmen ... or snowflakes ... or just all of your favorite white papers. We just want to see the amazing beauty that comes from the absence of colors. Stephanie says, "I won't lie, I was stuck this week. I finally just grabbed every piece of white designer paper and white embellishment I could find in my stash and laid them all out on my craft table. Then I went hunting for inspiration in my favorite place ... the talented Lauren who I knew has a particular talent with the color WHITE. 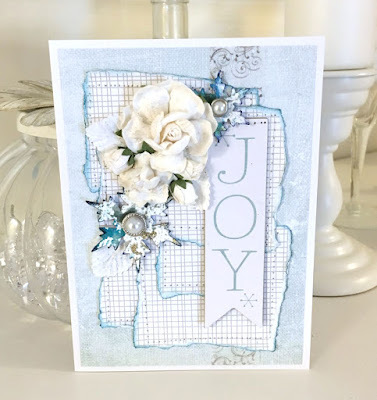 I took my inspiration from her gorgeous card from 2013. 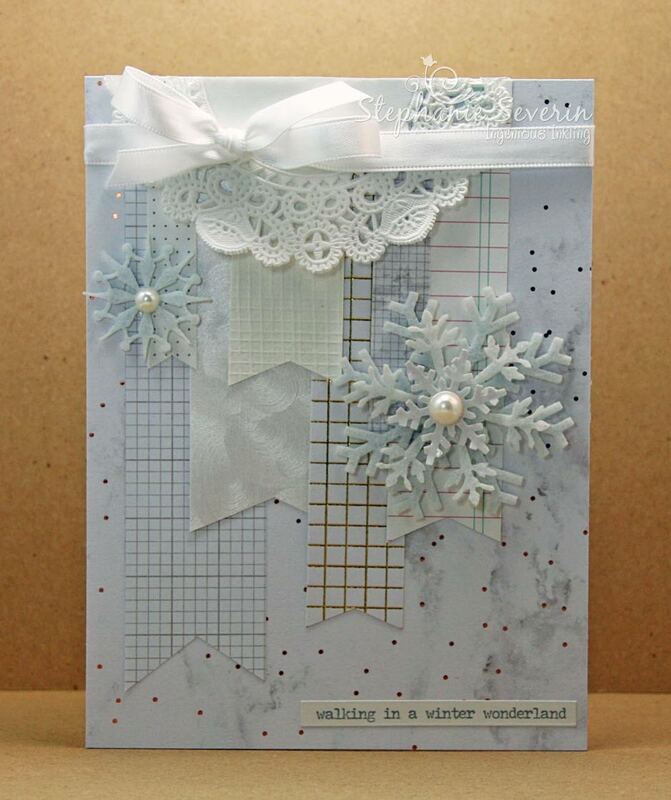 Lots of white banners, felt snowflakes, white doilies, white ribbon and a white sentiment sticker. Lauren says, "Ok, so, I had really informative things to tell you about my card this week, and now I'm blushing so hard from what Stephanie said, that I can't remember, lol! But I have actually had quite a bit of practice with the white-on-white genre, because I have an aunt whose favorite color is white! My secret tactic when I can't use a range of colors is to compensate with lots (and LOTS) of texture. 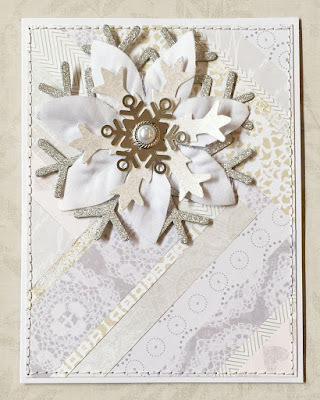 So my card has torn, inked and layered bits of a white gridded patterned paper (by Photoplay) topped with loads of lovely dimensional florals, a few diecut snowflakes that incorporate colorburst + modelling paste and a nice big chipboard sentiment. And before you ask about envelopes... this is definitely one that will get mailed with a package, or better yet, handed to its recipient in December!" 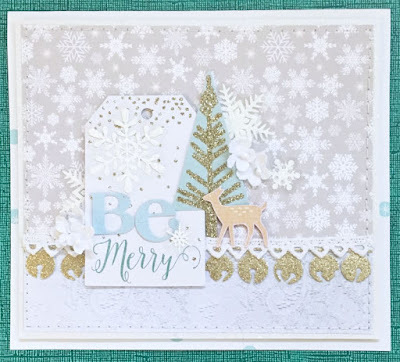 And now it's your turn to break out all of your white and create a marvelous holiday creation ... and link it here by 6pm (EST) on Wednesday, June 27th. keyword for galleries and Flickr is JB:18:12. We loved seeing all of the wonderful bells in the gallery ... here are a few that caught our eye. 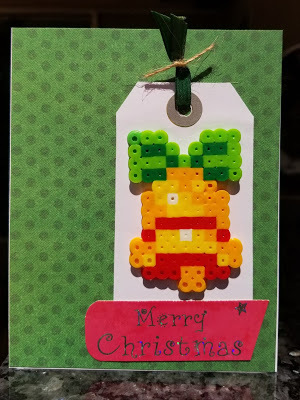 didn't have any bells in her stash ... so she made her own embellishment using Perler Beads ... how fun is that. 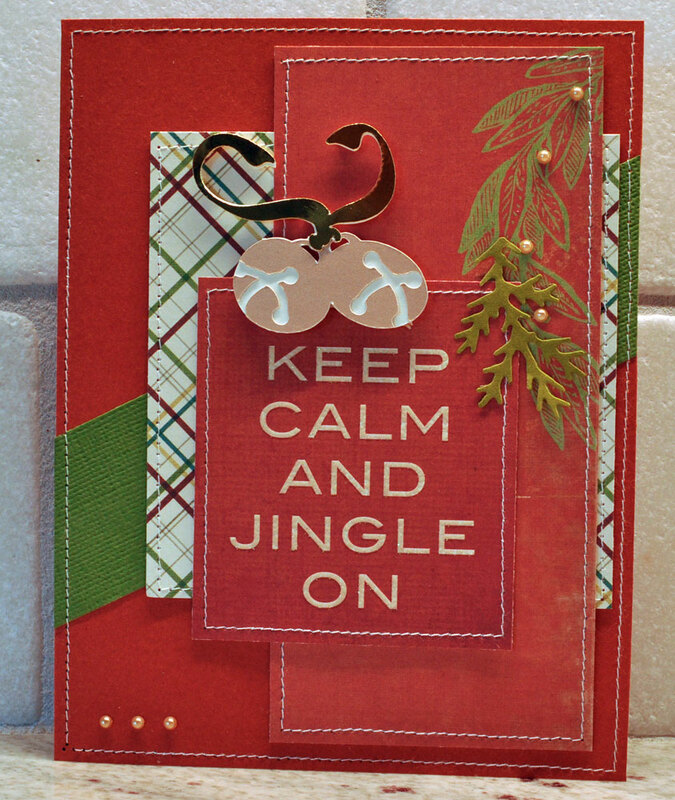 We're still going ring-a-ding-ding with Bells at Jingle Belles ... create a card that features one (or two or three). 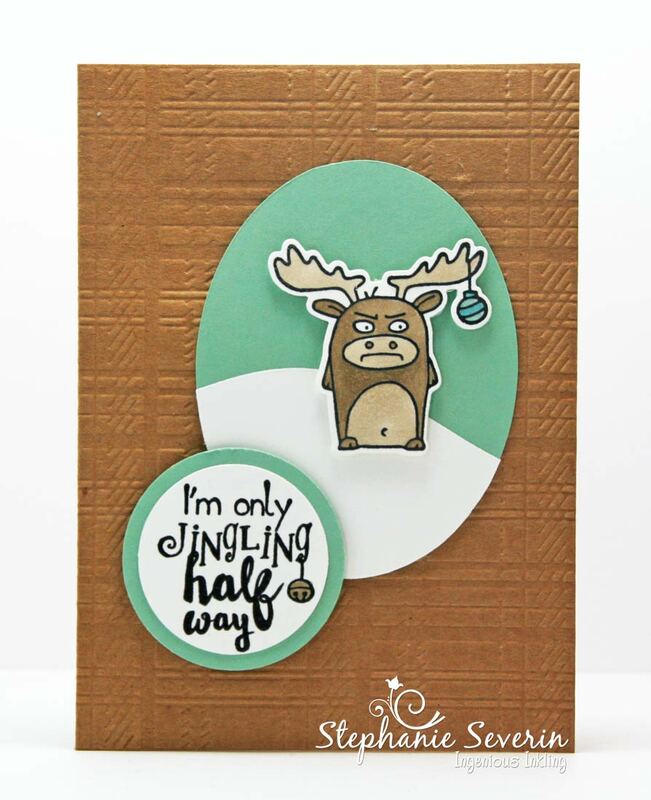 Stephanie says, "My card is only Jingling Half Way with my Taylored Expression Grumpling and a single jingle bell. 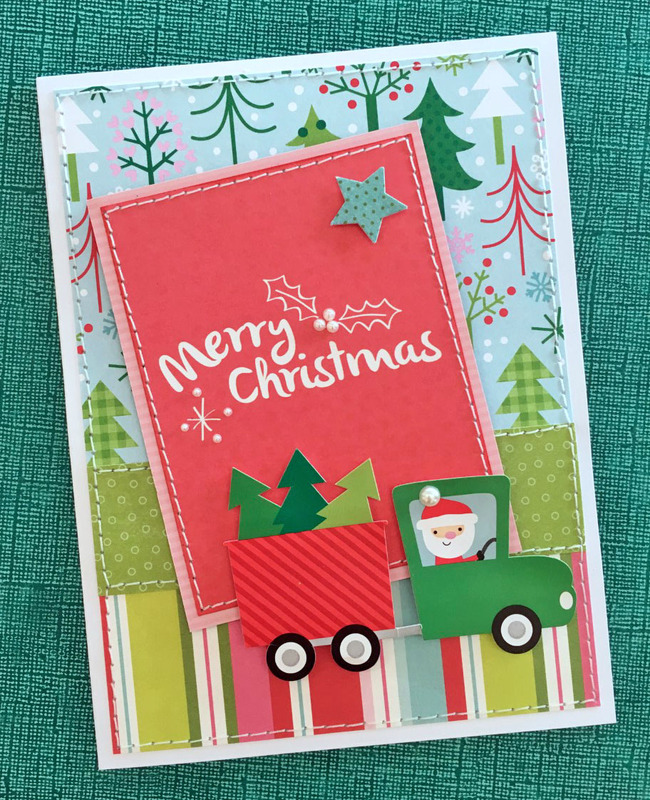 I embossed the front of the kraft card base with a Plaid Embossing Folder for a bit of texture and added color with Stampin' Up markers." Lauren says, "Surprise-- I've made another collage-y style card with lots (& lots!) of tiny embellies! 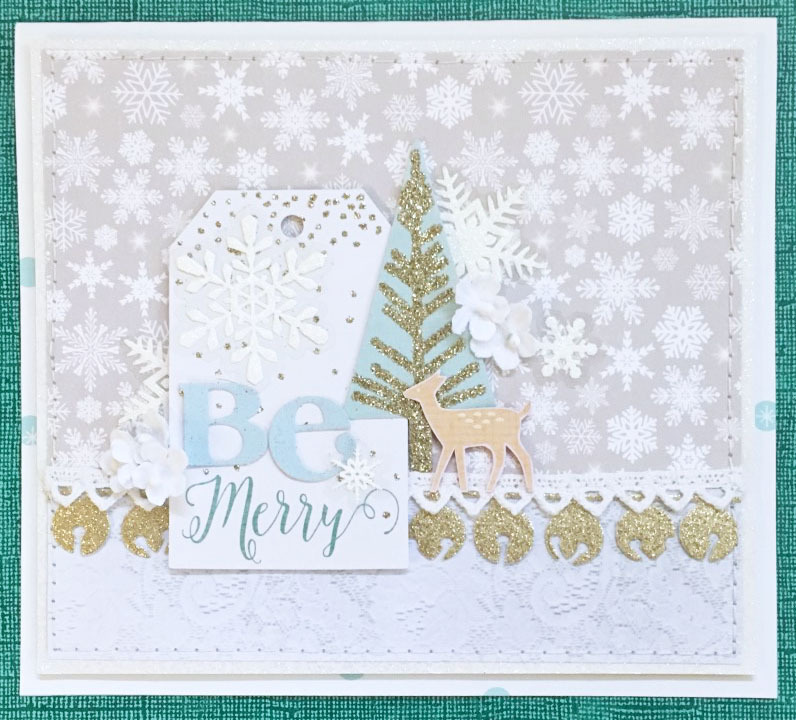 I've got a glitter diecut tree, tag and deer all from an older October Afternoon collection; two snowy patterned papers, snowflake stickers, teeny tiny white flowers, plus my all time favorite Memory Box Xmas die for those glorious glittery jingle bells. I finished off with a little vintage trimming and a couple of mats and that's it." Remember, you have until 6pm (EST) on Wednesday, June 13th to link-up your bell card ... keyword for galleries and Flickr is JB:18:12. Christmas Bells, Those Christmas Belles! That's right, it's time again for a brand new prompt and this fortnight we belles are all about BELLS! You can interpret this eponymous challenge any way you'd like, as long as you put a bell on it! 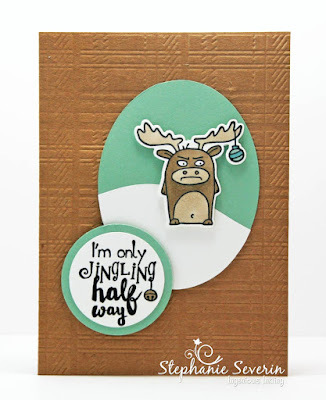 Lauren says, "I'started with the chipboard bell, then looked everywhere for a pre-printed sticker or journal card that said "Jingle All the Way". I honestly can't believe I do not own such a thing. But if I do, it managed to entirely elude me. So instead I made do with alphabet letters and some flower stickers. All on top of a piece of ancient Basic Grey patterned paper which had the collage effect and faux polaroid right on it. I added a little stitching for texture and a couple of mats. Easy peasy. 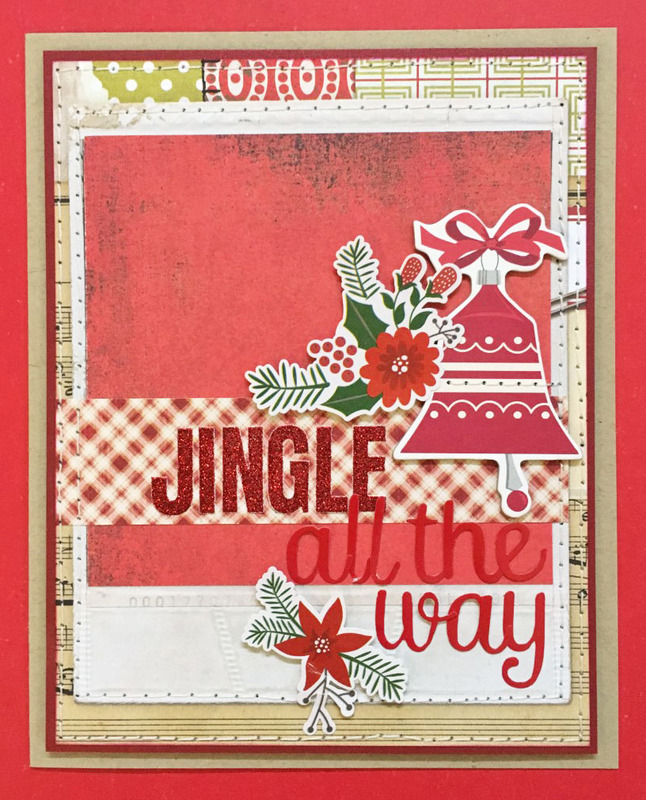 Stephanie says, "I searched my large paper stash and found this lovely Jingle Bells paper and built my card around it. The focal image is a 3-D Gift Tag and I finished with a sentiment sticker using this week's Paper Players Sketch." And now it's your turn to help us ring in this new challenge! Link your bell-bedecked cards here by 6pm (EST) on Wednesday, June 13th. keyword for galleries and Flickr is JB:18:12.